When the Moose Jaw Generals hit the ice against the Yorkton Maulers on Sunday, it was a night four years in the making — featuring an all-female officiating crew. When the Moose Jaw Generals hit the ice against the Yorkton Maulers on Sunday, it was a night four years in the making. It wasn't the game play that took that long to devise, it was the all-female officiating crew. This was the first time a male Saskatchewan Midget AAA game has ever been officiated entirely by women. Referees Michelle Stapleton, Alex Clarke, Cianna Lieffers and Krista Funke had been talking for years about officiating all together since it had been a dream of their refereeing mentor Jason Mercer, who has since died. However, they live all over the province and it was only in the past few months that they were able to make their schedules work and mark the Feb. 3 game in their calendars. "We definitely wanted to try to showcase our female officials and try and get out there as a whole crew. It was just, yeah, a very big goal of ours," Stapleton, from Regina, said in an interview with CBC's Afternoon Edition. Before the game, the four women marked the honour with their usual high fives and fist bumps. They were extremely motivated to do a good job, but once they were on the ice it was just like any other game, Stapleton said. "It was so much fun. We as a crew had a really good time being out there together. The hockey was good, the game was good, all of it. We couldn't have asked for a better game to work," she said. The players didn't react, or seem to notice the historic officiating crew, she said. The crowd, on the other hand, did. "I'm sure there is a couple of people out that were shocked but I think we did a really great game together and I think that we proved that we could be out there as a crew," she said. One of the best moments of the night came after play ended, when the game supervisor told the women he was "overjoyed" with their performance on the ice, Stapleton said. "It was just nice to see that we finally had four of us that were all qualified to be out there together," Stapleton said. 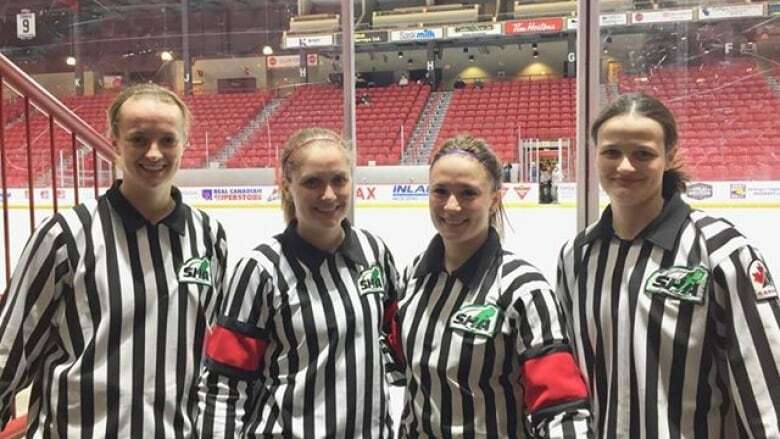 Growing field of female referees in Sask. Stapleton, now 28, got into refereeing when she was 13. She had been a figure skater and grew up learning the rules of the game from her brother. After a friend got into refereeing, so did she. Overall, Stapleton said she doesn't feel she's treated that differently from males in the field. "We all get our little bit of share of the comments and the disagreement but I don't think it's any more being male or female," she said. When she started there were only about 10 female officials working in Midget-age hockey and she's seen that number explode since then — and, they're sticking with it long enough to work at higher levels, Stapleton said. She's officiated games for women's games at international hockey tournaments and across Canada for both male and female games. She said she's open to whatever opportunities come: that could mean a route of officiating for women's games on the international level or work with the Saskatchewan Junior Hockey League, but she's open to whatever opportunities come up. A previous version of this story incorrectly stated their refereeing mentor was Ryan Mercer. His name is in fact Jason Mercer.